So far in this series, James Franco has talked about his education and public image, as well as his appearances on the American daytime drama, General Hospital. Here, Franco discusses his early career, working with actor Brad Renfro on Deuces Wild, and what happened after the Oscars left Brad out of their ‘In Memoriam’ tribute. Early on in my career I did two movies with the actor Brad Renfro. He passed away 4 years ago of an overdose. He was discovered when he was 12 or 13 years old and put in a movie called The Client with Susan Sarandon and Tommy Lee Jones. He had a lot of natural talent and that movie led to other movies and he moved to LA, and had a career at a young age. And then he got involved in drugs at a young age. We did a movie together, called Deuces Wild. It’s a very bad movie but when they were holding auditions for the film it was early on in my career, and it was directed by Scott Kalvert, executive produced by Martin Scorsese, who I think has subsequently taken his name off it, the cinematographer was John Alonzo, who shot Chinatown and Scarface. It was a cool script. It took place in the 1950s. But it felt like it could be my generation’s Mean Streets. And there was a role in there that felt like it could be the De Niro role, Johnny Boy, from Mean Streets. So, every young actor I knew wanted that role, including me. I auditioned and thought I did a really good job, but I didn’t have what they call name value in Hollywood. The way movies work… they go out and pre-sell the movie overseas, in Europe, in Asia, off somebody’s name. So, if you have Sylvester Stallone or Arnold Schwarzenegger in a movie, these territories know they can make this amount of money off that name. My name value was zero at that point but I didn’t understand that. 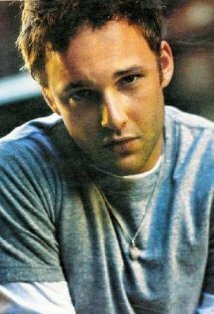 After I did the great audition I heard that Brad Renfro got the role. At that point his career was falling apart and when he showed up for rehearsals, I was not only devastated that I didn’t get the role but I was shocked and angry because he was still in his early 20s but looked like he was 45… he was losing his hair and had a gut and looked like he was my dad or something. I just didn’t understand how he got this role, but I accepted it. There were a lot of people in that movie – Matt Dillon, a bunch of actors from The Sopranos, Balthazar Getty, Stephen Dorff – who had done really great work, and so we all had high expectations at that point. But then they held it for 2 years because it was so bad, and released it on the day the first Spider-Man movie came out. And that was the movie that broke the box office record for opening weekend. So, Deuces Wild made about $2. Then I was asked by a company called The Thing, which manufactures objects with guest creators, if I’d do something for them. Brad had just passed and he wasn’t mentioned at the Oscars when they do the end memorial. For me it felt a little strange because he had acted with Bryan Singer and Ian McKellen in Apt Pupil and had given some very good performances, but towards the end of his career, there was a long and painful decline. 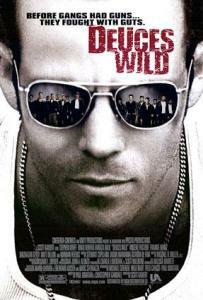 So, I thought back to Deuces Wild and it really typified for me the predicament of an actor in Hollywood where you can have high hopes, you can put a lot into a film and then ultimately it’s out of your hands. And that’s the world we live in and the world I had to accept. But it’s also one of the reasons I have branched out into other fields… it enables me to surrender to the process of filmmaking when I need to do that because I have these other things where I have more of a voice and more control. So, what I did was I designed a switchblade with Brad’s name on it and on the blade it says ‘forever’, which is kind of violent. But I felt he needed a violent reminder because, in my mind, he’d been so violently forgotten. Then, I had this tattoo artist use one of the switchblades to carve Brad into my arm and we turned it into a Gucci billboard and put it on Sunset Boulevard. It felt like it was a way to infiltrate the mainstream world one more time, or put him back in the mainstream world he’d been left out of. For his version of the movie My Own Private Idaho with River Phoenix, click here.